Bacterial Yin and Yang of Cheese – microBEnet: the microbiology of the Built Environment network. 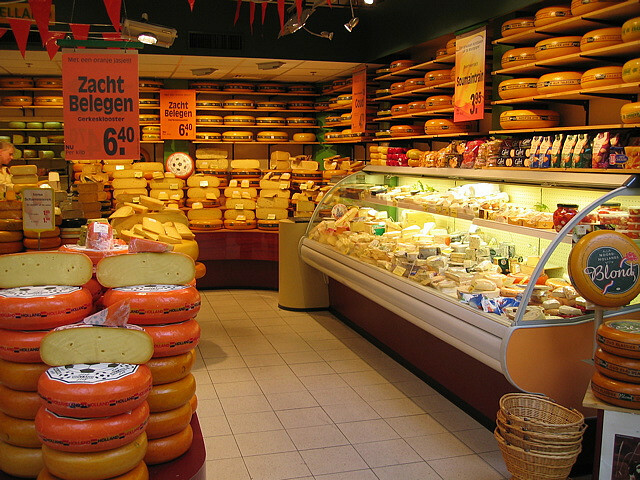 Cheese has often been studied as a microbe-rich environment. The variety of interactions in one of the tastiest foods on earth (personal opinion) is still only just being discovered. A recent paper from Stellato et al attempts to study these interactions by swabbing and sequencing the food itself and the various surfaces it comes into contact with during the cheese-making process. In addition to finding a highly diverse microbial community, the core microbiome was made up of both lactic acid bacteria and food spoilage bacteria. It was found that many species of food spoilage bacteria were excluded by lactic acid bacteria. Lactic acid bacteria like S. thermophilus were found mostly on the cheese, while food spoilage bacteria were found on the various manufacture surfaces. Other microbes, like the yeast D. hansenii, can also reduce the risk of spoilage by certain bacteria. D. hansenii was found in the dairy house environment. Further, surface contamination seemed to be dependent on the surface materials around the diary facility. Cleaning procedures had a big effect on the spatial distribution of microbial communities. This highlights the importance of properly cleaning and maintaining equipment used in food processing. Since the fermentation of cheese tends to exclude many spoilage microbes already, downstream equipment is of high importance. An interesting suggestion in the discussion section of the article was that the plastic gaskets on equipment be replaced with stainless steal ones; although plastic is cheaper, stainless steal had lower microbial diversity. Overall, this article suggests a connection between food processing equipment/environment and food quality. Some cheese in its natural habitat. Via Flickr under the creative commons public domain license.